by Dave from The Longest Way Home ~ November 17th, 2015. Updated on October 28th, 2016. Published in: Travel blog » Nepal. Day two of the week long Tihar festival in Nepal and it’s much more colorful than the previous days crow festival. It’s the celebration of “man’s best friend” the dog. Known as Kukur Tihar (Nepalese) or Khichā Pujā (Newar) it’s celebrated all over the country by both Hindus, Newars and tourists alike. Humankind’s close relationship with their loyal canine friends has a long history. 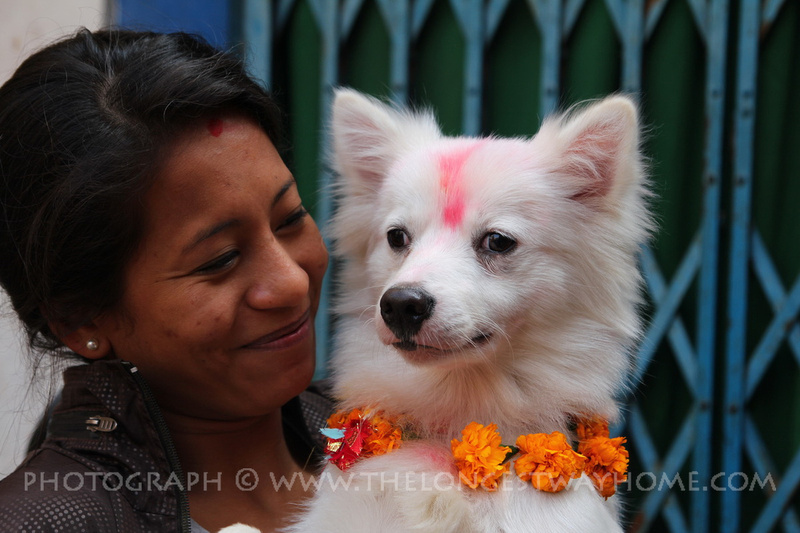 Devotion, love and work companions are celebrated in Nepal just as everywhere else in the world. There is some history too. Lord Yamaraj, the god of death, is believed to use dogs as his messengers. 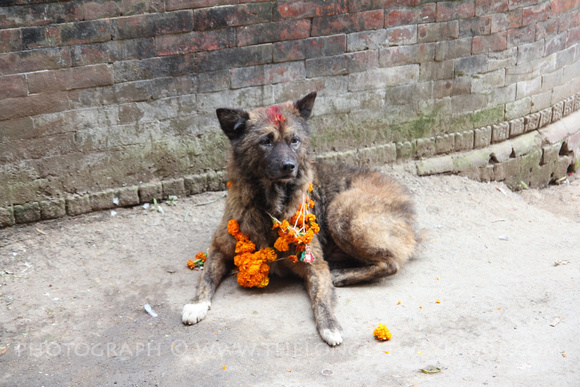 So every year dogs are given thanks to in Nepal. Dogs also barked before the 2015 earthquake and before the aftershocks thereby giving warnings to people. Dogs were also extremely helpful in locating human survivors in the collapsed buildings. The day starts like any other. The sun shines and the sleepy dogs stretch out on footpaths, roads and open spaces to soak up the sun. 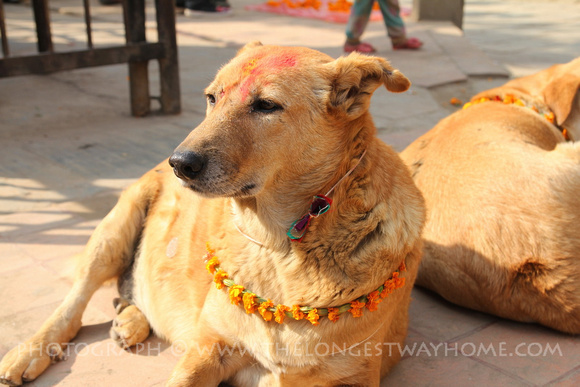 Their naps don’t last long though as people come by and give a tika (red dye) to the forehead of the dog. 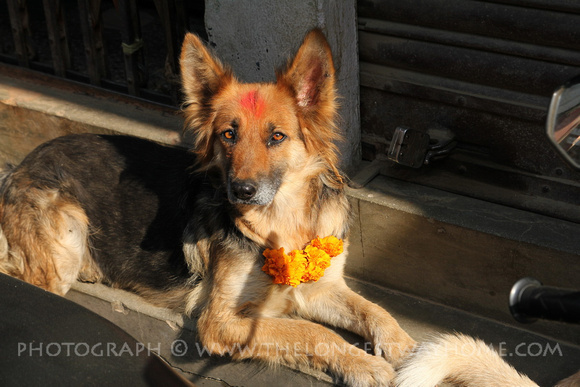 More festive people have small colorful garlands made and place them around the dogs neck. Others simply pat the dog with some thankful words. Family pets are often treated to some tasty bones or extra food on the day. This applies to all dogs. From family pets to those loud ever barking street dogs that drive many a tourist mad at 2am. Wherever there is a dog! Thamel is not the best place in Kathmandu. 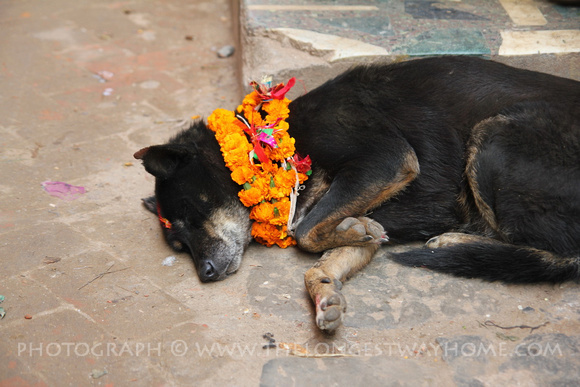 The old city between Durbar Square and Thamel where people live with family pets is a good place to go. As is Durbar Square (if you are lucky). In Pokhara head to lakeside or the back of lakeside where their are family dogs. Likewise in most other big cities in Nepal. You can buy special dog sized garlands for dogs from many vendors. Just a word of caution though. 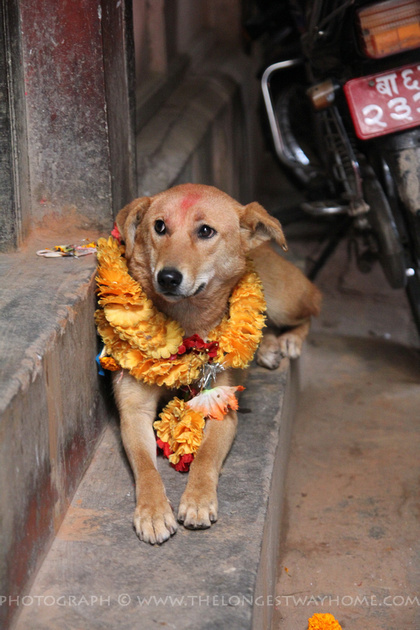 Dogs in Nepal are not that disciplined. Do take care when approaching any. It’s much better to approach the owner of a well groomed dog and ask permission before approaching a dog! Tomorrow is day three of Tihar and it gets even more colorful as people celebrate the cow and turn street lights on. Here’s a full list of festivals in Nepal. Need a hotel in Nepal? I recommend you try my own hotel search for Nepal. The best online rates guaranteed!